Certainly if ever a group were in need of a good public relations firm, it would be native plants. 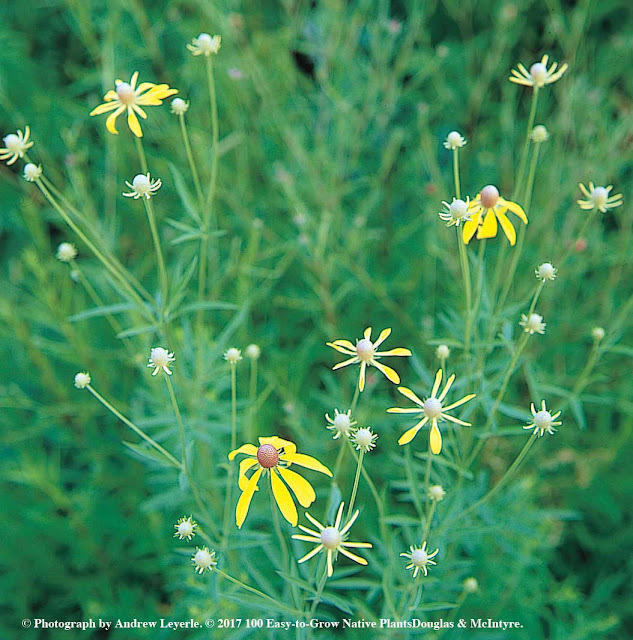 Even though there has been a surge of interest in native plants in recent years, there's still a lingering bit of snobbery that sees natives as plants not worthy of a prominent place in our gardens. One person whose never suffered from this lack of appreciation for natives is Lorraine Johnson. She's a Canadian gardening icon whose been writing about the virtues of natives for decades. This spring Douglas & McIntyre has launched no less than a third edition of classic 100 Easy-to-Grow Native Plants for Canadian Gardens with a revised introduction, updated botanical names and new information on how to support native pollinators. One of the first things Lorraine did, at a recent talk at the Stratford Garden Festival, was to clear away two common misconceptions about native plants. The first was that native plants are little more than weeds. But as Lorraine went on to point out, most nuisance weeds like dandelions, aren't native at all. They were brought to North America by European settlers where they escaped the confines of home gardens and spread into the surrounding landscape. The second assumption was that all native gardens have one basic look to them– that of a natural meadow. The chiché that springs to mind is the rogue suburban gardener, hated by all their neighbours for having a wild looking front garden filled with native flowers and tall grasses. But is it actually the case that a natural garden must always be hopelessly out-of-step with tightly clipped lawns and manicured flowerbeds that dominate most suburban neighbourhoods? 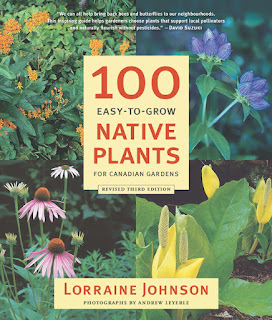 From 100 Easy-to-Grow Native Plants for Canadian Gardens, Lorraine Johnson. Photograph by Andrew Leyerle. ©2017. Published by Douglas &McIntyre. Excerpted with permission of the publisher. The reality, Lorraine said continuing her talk, is the look of a native garden depends more on the plants you choose than on the fact that you chose to garden with natives. As you can see by this garden from the book (above) a native garden can be lush and green, while being fairly neat and compact. The carpet of groundcovers on this woodland slope include False Solomon's Seal, Maianthemum racemosum, syn. Smilacina racemosa, Wild Ginger, Asarum canadense, Cinnamon Fern, Osmunda cinnamonomea, syn. Osmundastrum cinnamomeum. It's easy to imagine a tidy front garden that is a combination of a few dwarf conifers and a mix of these native plants. One of the things Lorraine credits for the recent surge of interest in native plants is their ability to make us feel we are making a change for the positive on an environmental level. The global nature of environmental problems can leave us feeling overwhelmed. Governments that dismiss the impact of climate change can leave us frustrated. But in our own home gardens we have the power to create healthy, diverse ecosystems that support endangered bee and butterfly populations along with a whole host of other beneficial insects that depend on native plants. In the introduction of her book Lorraine writes,"I'm convinced that a simple trowel is a grand place to start the necessary (and, in moments of hope, I think inevitable) transformation of our culture from nature dominance to nature partnership." Even though I am committed to these same lofty goals, I have to say that they are not the primary reason for my interest in native plants. I honestly happen to think they are amazing. 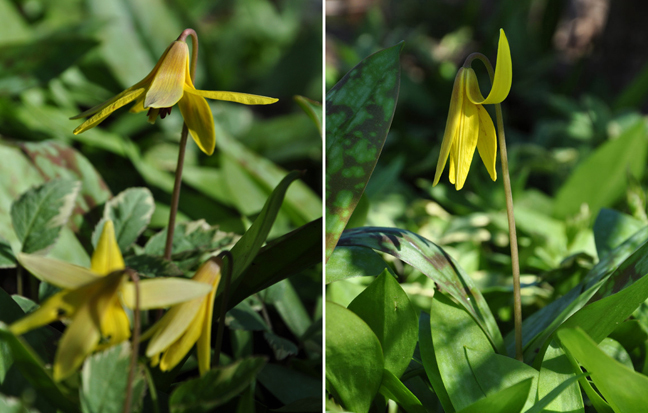 In recent years, I have discovered native Trout Lilies, Erythronium americanum with their spotted, green leaves spotted growing in the vicinity of my garden. 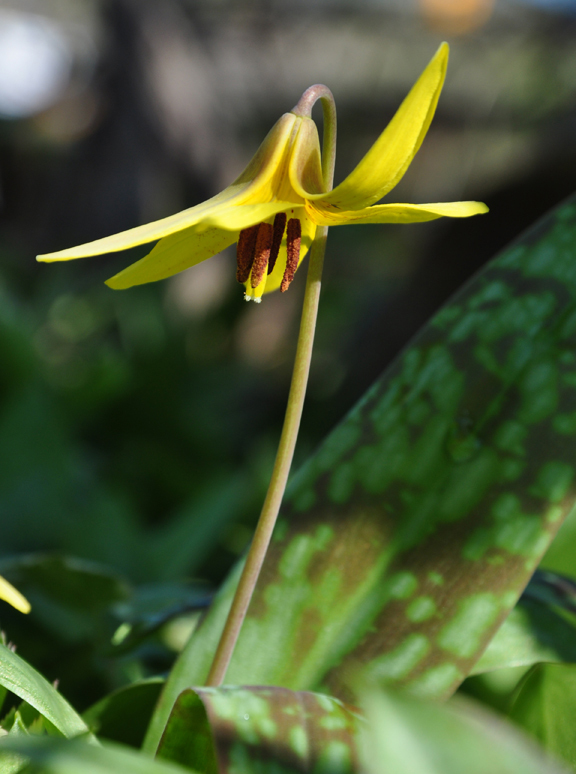 They are one-third the size of fancy hybrid Erythroniums blooms and yet their simple blooms make them utterly charming. A year ago I brought home some native Bloodroot, Sanguinaria canadensis from my mother's garden. I just love the way the fresh, daisy-like flowers emerge wrapped up in leafy grey-green arms. The more I have gotten to know native plants, the more I have come to really appreciate their unique and fascinating qualities. I am intrigued by any number of the natives in Lorraine's book. 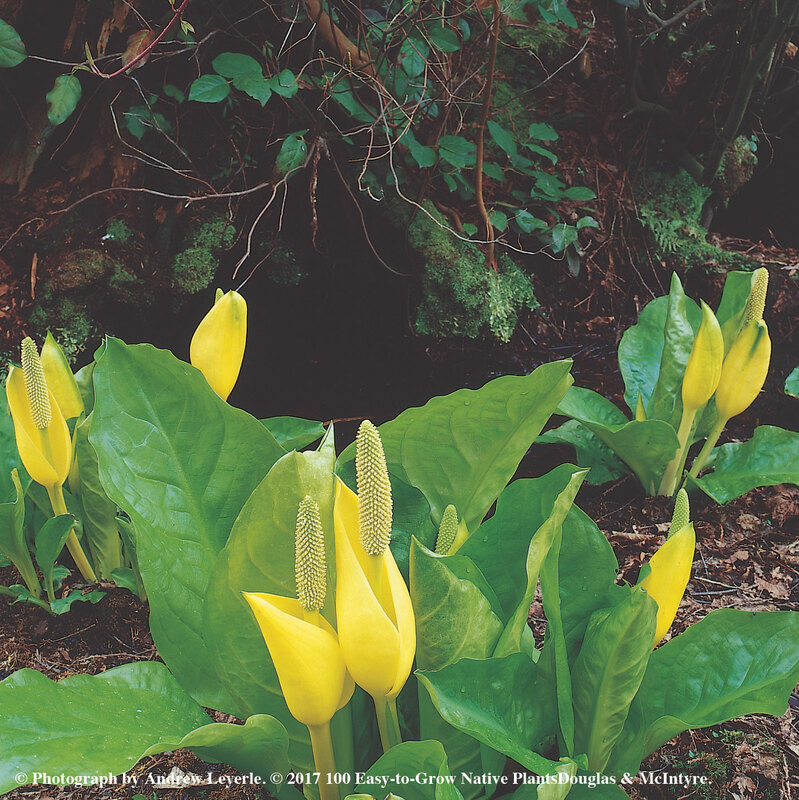 Take this Skunk Cabbage, Lysichilton americanus, for example. What a curious and intriguing looking plant! A conversation piece to be sure. If we manage to get our garden pond done this year, it might make a nice addition to the pond's damp edges. This is just one example of course. The book has many unusual and beautiful plants to offer. If you follow this blog, you'll know I like books that are well-organized with concise information that you can act on right away. Following a brief introduction and a bit of guidance on how to use the the information in 100 Easy-to-Grow Native Plants for Canadian Gardens, the reader moves on to one hundred and one native plant profiles. There is a picture with each listing, a general description of noteworthy plant characteristics, pointers on maintenance, growing requirements and propagation. The notations on plant combinations are ones Lorraine has seen and enjoyed herself (although she encourages gardeners to experiment with plant combinations of their own). Some native plants have a very broad range, growing across most of the continent. Others have a more restricted range, so Lorraine ends each listing with notes on related species. There is one other little thing I should mention– especially hot-on-the-heels of my post on aggressive plants. Lorraine doesn't mind natives that have a tendency to wander and spread. If this is a concern for you, double check that the native you choose is one whose growth is polite and controlled. Most handy are the charts that the end of the book that allow you to shop at a glance for plants appropriate for specific conditions, such as acid soil. 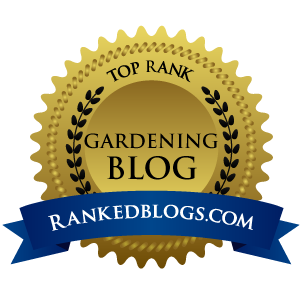 I'd even suggest that, after you finish the introduction, you start by selecting interesting plants from the appropriate chart and then go to the full profiles to make sure the plants you've chosen meet all your growing requirements. I think you will find that 100 Easy-to-Grow Native Plants for Canadian Gardens is an excellent reference that you will turn to again and again. 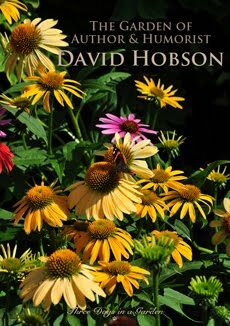 Publisher Douglas & McIntyre has given me a copy of the revised edition of 100 Easy-to-Grow Native Plants for Canadian Gardens to give away. Because this book will go to a winner through the mail, I will have to limit entry in the draw to readers in Canada and the USA. Please leave a comment below, if you would like to be included in the book draw. The draw will remain open for the next two weeks (until Sunday, April 23rd). 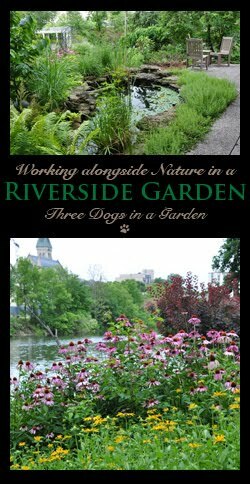 If you are not a blogger, you can enter to win by leaving a comment on the Three Dogs in a Garden Facebook page. You are also welcome to enter by sending me an email (jenc_art@hotmail.com). 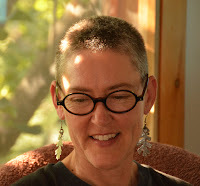 Lorraine Johnson is the former president of the North American Native Plant Society and is the author of numerous books on gardening and environmental issues. She is also the editor of The National Treasures of Carolinian Canada; Canadian Gardener's Guide; and What Plant Where Encyclopedia. She lives in Toronto. 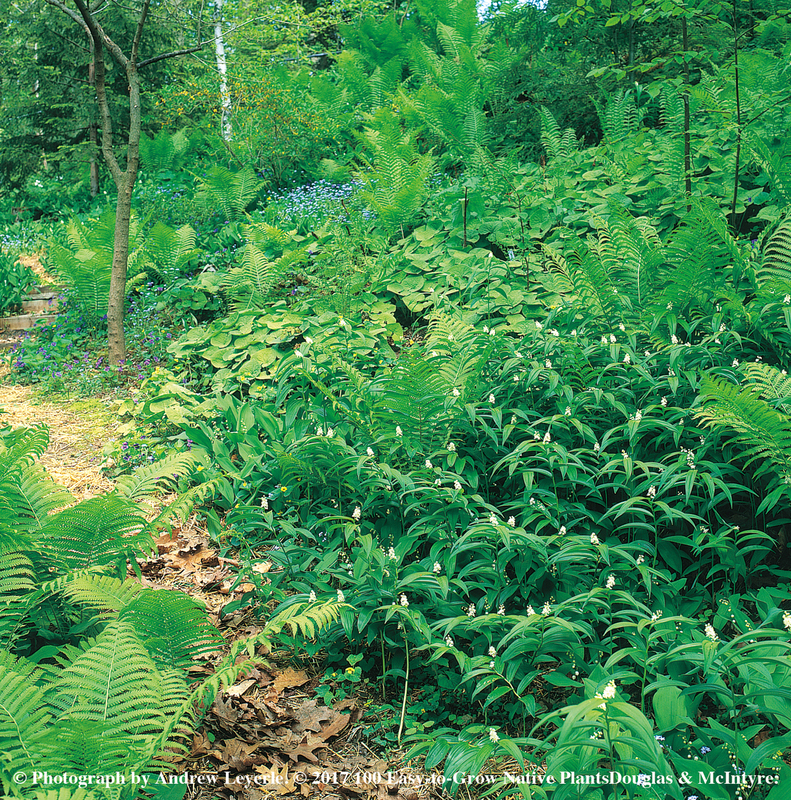 For more information about 100 Easy-to-Grow Native Plants for Canadian Gardens, visit the Douglas & McIntyre's website. What a fascinating book! Please enter my name in your draw. Thanks! Sounds like a great book, please enter my name! I love learning about and incorporating native plants in my landscape. Thanks for this awesome giveaway! Lee P - what a timely book. Please include me in your giveaway. Omigosh - pick me, pick me! I'd love to have this book. Thanks for the giveaway Jennifer! This sounds like a wonderful book, Jennifer. I actually love native plants, and we have plenty around here! :-) It seems like each spring and summer, I find one or more that I need to identify. 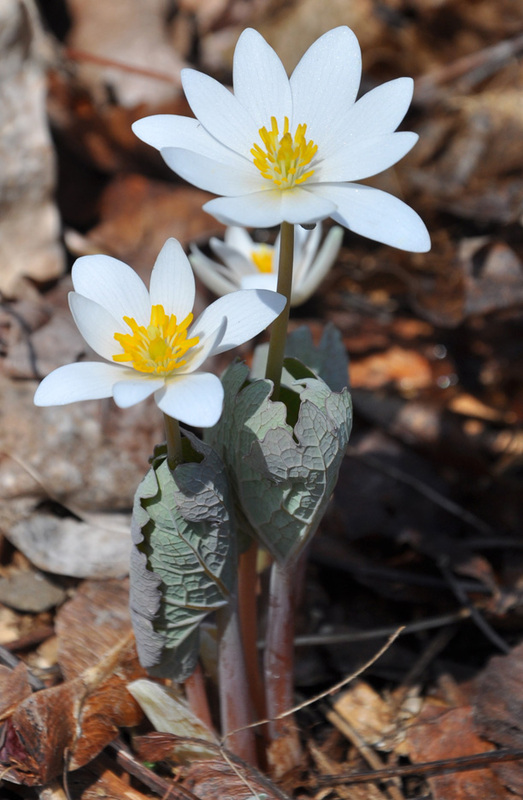 I love both the trout lily and the bloodroot here. Beautiful flowers! We do well with the spring natives but need help with the summer native. So this book would be helpful.